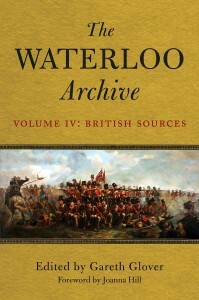 As explained in earlier volumes in this series, there is a great deal that has been written on the subject of the Battle of Waterloo and the campaign that surrounds it and there are even a smattering of works that deal with the subsequent three year occupation of France by the Allied powers. However, during my studies of this fascinating campaign, I have become painfully aware that much modern material has become a stereotypical regurgitation of previous publications with little if any new research. This to my mind is a terrible crime; as the archives of Europe, and of Britain particularly, are teeming with fascinating material which is gathering dust, the ink fading with time and the paper crumbling, virtually ignored by such self acclaimed historians and experts of this campaign. The reader might think that perhaps the story has already been told and there is simply nothing new to tell. Each letter and journal I discover proves this to be a fallacy; they all have something new to say; they challenge preconceptions; they disprove theories; they destroy myths; in fact, they prove beyond doubt that our ‘accepted’ history of the battle and campaign is wrong in so very many aspects and a complete rewrite of many episodes in the campaign will eventually be required. However, this cannot happen until all of this buried material is exposed to public scrutiny, allowing various aspects of the campaign to be fully re-interpreted. My aim is to challenge that situation and to provide the evidence for all, complete; without sensationalism; without attempting to brainwash or peddling implausible conspiracy theories. It is better surely to provide the unadulterated evidence, letting every person make their own judgement on the probable course of events and the reasons they occurred based on good solid primary evidence. In comparison, the British archives are unique, for they are brimming with personal letters to family and friends or journals that record their innermost thoughts, written only for themselves and close family. These teem with life; the agonies of those who lost someone; the pain and suffering subjected on the thousands of wounded and dying, is described in sometimes ghastly detail; the horrors of war are laid bare, but also the relief and happiness of survival. The human aspect of war and military campaigning comes to the fore, the humour and exhilaration; the fears and miseries; the starvation and exhaustion; the horror and the joy. All emotions are described and subsequently absorbed by the reader as they become embroiled in their personal challenges; a bond is formed, their happiness is shared along with their pain. As an example, I only have to point to the final poignant letter of Ensign Samuel Barrington of the 1st Foot Guards, who was struck down at Quatre Bras, at the age of only nineteen and the subsequent correspondence of those in the regiment who clearly were devastated by his loss. It will be found that a number of the correspondents within this volume are again simple men in the ranks. It is usually accepted that very few common soldiers of this period could read or write and that the few letters and journals that do exist emanate from more senior non commissioned officers, who were required to be able to write to perform their duties. The two previous volumes of British material have proven this to be a complete fallacy and this latest volume contains a further four accounts from the lower ranks. Their style of writing can be idiosyncratic, their language blunt, but their honest, forthright ways are refreshing and show how the ordinary man in the ranks saw things, giving a different aspect to our studies. It is particularly fitting that this volume contains a foreword by Joanna Hill, a renowned historian in her own right, as well as being a direct descendant of Lord Rowland Hill; as this volume contains the memoirs of two of his aides de camp that day; Captain Digby Mackworth and Captain the Honourable Orlando Bridgeman, who make clear Hill’s invaluable roll that day, which is largely overlooked by most histories of the battle. As a fascinating aside, which seems to have been ignored by historians; that Digby Mackworth in his letter home rushed off at 11 p.m. the very evening of the battle includes the immortal phrase ‘La Garde meurt mais ne se rend pas’. It is not attributed to anyone (it was certainly not said by Cambronne who had been captured by Halkett and was snug and warm at the inn in Waterloo village at the time) and is mentioned as if it was a well known phrase from a play, although the editor has failed to find any such source. This at least puts paid to the recent theory that it was invented by a French journalist at Paris some years later. Mackworth’s journal is also very interesting in a number of other respects; he shows that Hill held a poor opinion of the Prince of Orange’s military skills; he makes some disparaging remarks on the border defences and Belgian troops prior to the campaign; he admits that Wellington was surprised and caught flat footed by Napoleon’s invasion of Belgium and makes interesting comments regarding the difficulties of the communications with the reserve troops at Hal from Waterloo. However, both he and Orlando Bridgeman show a clear affection for Sir Rowland Hill as a man and great admiration of him as a general. Some other highlights from this current crop of letters and memoirs worth mentioning are those of Colonel Sir Colin Campbell, who reiterates that The Earl of Uxbridge was indeed very unhappy with the performance of much of the cavalry at Waterloo; despite his later more diplomatic assertions to the contrary. The journal of Private Thomas Playford of the 2nd Life Guards provides a fascinating and honest account of the famous charge of the heavy cavalry against D’Erlon’s attack and their subsequent decimation by French cavalry reserves. He tells of the utter confusion, with small pockets of cavalry in mortal combat in all directions and despite riding back and forth across the field, his own failure to cross swords with anybody! He also provides much valuable information regarding the death of Corporal Shaw, that most famous of Life Guardsmen, who appears to have succumbed to numerous wounds that eventually defeated the great man as his life’s blood ebbed away. Sir Hussey Vivian, the arch self publicist, concludes that Wellington was taken by surprise at the commencement of the campaign and candidly admits that initially when he received orders to move to the centre of the field, that he thought it was so that his cavalry could shield the withdrawal of the army from the field. As an antidote to all this gore; the early letters of Captain Arthur Kennedy, 18th Hussars, are filled with details of the fancy balls, horse races and cricket matches, that filled the weeks before was broke out so suddenly. Whilst Lieutenant George Packe 13th Light Dragoons interestingly writes home on 14th June that they are expecting to be attacked by Napoleon, that he will strike against the Prussians initially and that orders are expected shortly for Wellington to assemble his force so as to strike Napoleon’s left flank. Later in Paris he admits that the British troops did not compare well on parade with the gorgeous uniforms displayed by the Russian and Prussian Guards; however as he states ‘We came to fight not to be reviewed’. Miraculous escapes abound; First Lieutenant Samuel Phelps of the Royal Artillery describes a cannon ball smashing into the body of his horse, killing it instantly, whilst he was actually in the process of mounting it, without receiving any injury whatsoever. Whilst Captain George Barlow of the 69th Foot, was caught by French cavalry with his company formed in line at Quatre Bras and was ridden over; he escaped unharmed by simply playing dead! As a very interesting aside, Barlow was also the officer of the guard of a small detachment on the border a few weeks earlier when King Louis XVIII and his entourage arrived in his flight from Paris. Private Jeremiah of the 23rd Foot, describes a looting expedition before the battle and describes how he returned and presumably fought throughout the Battle of Waterloo plastered from head to foot in flour! First Lieutenant George Simmons of the 95th Rifles also left a fascinating account of his actions at the Battle of Quatre Bras and Waterloo, which surprisingly he did not utilise in his famous memoir. It honestly describes men who were weary of war and perhaps understandably a little more cautious than they had been in Spain; in an attempt to preserve their lives. But, the consequences of war should not be overlooked or forgotten; a series of letters written by Staff surgeons treating the mass of wounded housed in every available building in Brussels and Ghent, now turned into temporary hospitals tells of the human cost. The letters are quite matter of fact; being factual updates on patients, doctor to doctor; but they also describe in detail the horrific injuries suffered and the primitive treatments and horrendous pain endured by the wounded. Indeed, it should be noted that the surgeons were given little time to prepare for this campaign, many senior posts only being filled days before the fighting commenced. This led to errors, mismanagement and undoubtedly unnecessary suffering, but the surgeons did everything possible to surmount these problems. However, despite their best endeavours, their valiant efforts could not make up for shortfalls in the organisation and it must be honestly stated that the survival rate of the wounded following the Battle of Waterloo was markedly worse than that achieved by a thoroughly professional organisation working at its most efficient only a year earlier at the Battle of Toulouse. A few reports from military experts soon after the battle throw up some fascinating issues; for example, the renowned Royal Engineer, Colonel Burgoyne, states that detachments of sappers used at La Haye Sainte the night prior to the battle may well have made it virtually impregnable and that earthworks along the crest of the ridge would have preserved many lives from the cannon fire and could have caused serious disruption to the massed cavalry attacks. However, as we know hindsight is a wonderful thing! A civilian visitor to the field of war only four weeks after the battle completes this selection which I trust will engage and fascinate the reader. They all combine to bring the story of the Battle of Waterloo and the surrounding military campaign to life, you march with them; you fight with them, you die with them!